It's probably safe to surmise that sitting in front of a screen all day at work and in front of the TV all night isn't doing much for your physical health or self-image. A sedentary lifestyle, the default for many office workers, students and retired people, does little to raise your fitness level, your energy, your self-confidence or your general sense of well-being. But looking good, feeling strong and having a positive attitude, the attributes of self-esteem, are all benefits of a regular exercise regime. Regular exercise makes your heart and bones stronger, lowers your risk for chronic disease right along with your blood pressure, keeps your weight under control and reduces feelings of anxiety and depression. While you're boosting your energy levels, oxygen capacity, muscle tone and general fitness, a side benefit is an increase in self-esteem. Just the success of creating an exercise plan and sticking to it allows you to enjoy a sense of achievement. Getting a move on is good for your body and mind. 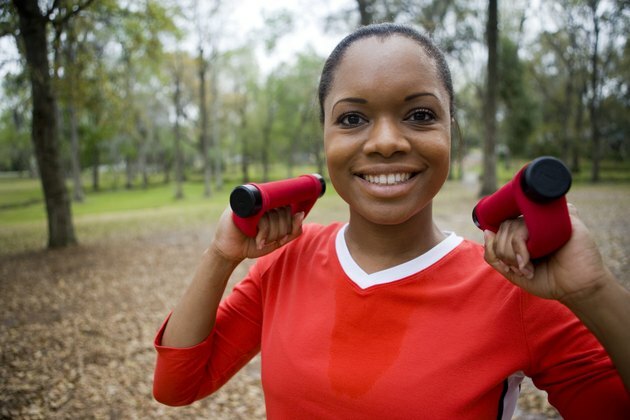 The Cleveland Clinic suggests exercising for 20 to 30 minutes every day, picking an activity you enjoy so you'll stick with it, varying what you do to ward off boredom, and mixing classes, sports and exercise with friends, and individual workouts to keep things interesting, keep pounds off and keep your confidence high. Society is obsessed with body image and, for many people, how they look has a direct bearing on self-esteem. Idea Health & Fitness Association notes that your personal body image -- toned, balanced weight, pleasing proportions, posture, vitality and other factors -- is as important as your strength, competence at sports and other measures of physical fitness. Regular exercise, with an emphasis on aerobic exercise, can have a positive effect on self-esteem -- especially for those who suffer from low self-esteem -- as fitness and appearance improve. There is no proven formula for how much or how often to exercise to affect self-esteem so Idea Fit recommends following the American College of Sports Medicine guidelines: 20 to 60 minutes of dynamic activity that challenges major muscle groups, 3 to 5 days a week; 8 to 10 resistance exercises for strength-building practiced 2 to 3 times a week; and a stretch session for flexibility at least twice a week but, ideally daily. Thirty minutes of moderate aerobic exercise is enough to release the beta-endorphins that increase feelings of well-being, and to lower levels of cortisol, the hormone associated with stress and anxiety. In studies evaluated by scientists at Nova Southeastern University and published in "The Internet Journal of Allied Health Sciences and Practices," researchers concluded that low- to moderate-intensity aerobic exercise produced positive results in mood improvement and psychological functioning. High-intensity exercise did not decrease stress and anxiety and, in the context of challenge and competition, appeared to increase anxiety in some cases. The psychological benefits of physical activity lasted longer after moderate exercise than after high-intensity exercise. However, research into the mood effects of high intensity exercise is less prevalent than other research. For an experienced exerciser in a non-competitive situation, one can leave open the possibility that mastering intervals of high intensity exercise can add to the sense of accomplishment. Yoga, meditation, tai chi and qigong decrease tension, anxiety, depression and anger and improve psychological functioning. A yoga practice, according to "Yoga Journal," lowers levels of cortisol and adrenaline, and helps to regulate blood sugar, blood pressure, insulin resistance and the "food seeking behavior" inspired by stress that leads to weight gain and added abdominal fat. Meditation stimulates the prefrontal cortex that controls happiness levels and healthy immune function. Sit on a cushion and focus on your breathing, stretch up into a backbend, even chill in Corpse or Child pose, and you calm down, release tension, and improve coordination, quick reactions, IQ and memory. You'll also sleep better and regulate your emotions, leading to more effective social interactions and a positive self-image. The Internet Journal of Allied Health and Sciences Practice: Depressed, Low Self-Esteem: What Can Exercise Do For You? Cleveland Clinic: How Does Exercise Improve Depression?